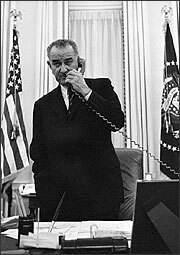 On this date in 1965, President Lyndon B. Johnson informed Alabama’s Governor George Wallace that he will utilize federal authority to order the Alabama National Guard to control a prepared civil rights march from Selma to Montgomery. Bullying and bigotry had earlier blocked Selma’s black population–over half the city–from registering and voting. On Sunday, March 7, 1965, a gathering of 600 demonstrators marched on the capital city of Montgomery to oppose this disenfranchisement and the earlier murder of a black man, Jimmie Lee Jackson, by a state patrolman. In brutal scenes that aired on television, state and local police assaulted the marchers with billy clubs and tear gas. 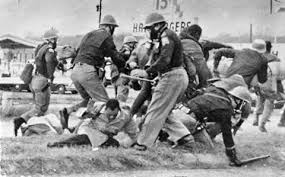 TV spectators far and wide were outraged by the pictures, and a protest march was organized just forty eight hours after “Bloody Sunday” by Martin Luther King, Jr., head of the Southern Christian Leadership Conference (SCLC). King directed the marchers to turn back around, nevertheless, rather than carry out the march without federal constitutional support. After an Alabama federal judge ruled on March 18 that a third march could go forward, President Johnson and his advisers worked instantly to find a way to guarantee the protection of King and his demonstrators on their passage from Selma to Montgomery. The most compelling obstacle in their way was Governor Wallace, an outspoken anti-integrationist who was reluctant to use any state funds on guarding the demonstrators. Hours after vowing to Johnson–in phone calls recorded by the White House–that he would order out the Alabama National Guard to preserve order, Wallace went on television and charged that Johnson should send in federal troops instead. Infuriated, Johnson then ordered Attorney General Nicholas Katzenbach to write a press release stating that because Wallace refused to use the 10,000 prepared guardsmen to preserve order in his state, Johnson himself was calling the guard up and giving them all required support. Some days following, 50,000 marcher joined King in an amazing 54 miles, under the observant perceptions of state and federal troops. 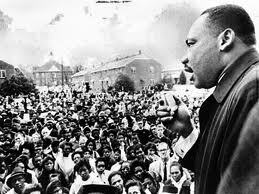 King delivered his famous “How Long, Not Long” speech from the steps of the Capitol building. Entering safely in Montgomery on March 25, all attended when King delivered his famous “How Long, Not Long” speech from the steps of the Capitol building. 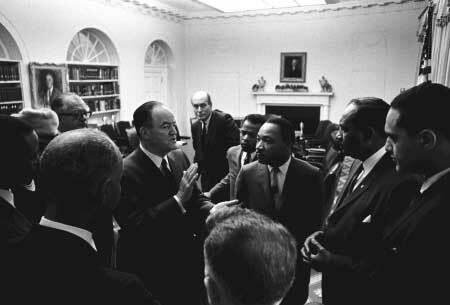 The dispute between Johnson and Wallace–and Johnson’s decisive response–was a significant turning point in the civil rights crusade. Within five months, Congress had enacted the Voting Rights Act, which Johnson boastfully endorsed into law on August 6, 1965. Gregg Greer a Public Speaker, Minister, and Social Activist Gregg Greer as the Editor of One World, and One World Today internet journals. you can reach him at one1worldtoday@gmail.com. This entry was posted in Civil Rights, Gregg Greer, greggrreer, Human Rights, One World, oneworld, oneworld01, SCLC, Uncategorized, Urban Christian Leadership and tagged 1965., Alabama, Alabama National Guard, August 6, Bloody Sunday, Civil and political rights, Civil Rights, civil rights act of 1968, Civil rights movement, george wallace, Governor George Wallace, Governor Wallace, gregggreer, greggLgreer, How Long, Human Rights, John Lewis, LBJ, London Johnson, March 7, Martin Luther King, Montgomery, Montgomery Bus Boycott, Not Long" speech, On Sunday, one world, oneworld01, president, President of the United States, selma march, Selma to Montgomery, United States, world.